Can you hear the birds chirping and see the flowers fruitfully blooming? Spring is officially in the air! As we enter into this glorious and fresh season, we’ve got one thing on our mind — spring cleaning! There’s nothing more satisfying than having a fresh start, so spring cleaning is the perfect excuse for cleaning out those cupboards, sorting through old clothing, and getting your home back in order following the long, chilly winter months. With so much to do, it’s difficult to know where to start. 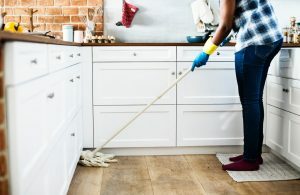 Don’t worry, follow this easy guide to cleaning out those easy-to-miss spots in your home that need some loving and attention. Doormats have a big responsibility in our homes. They help keep unwanted dirt and mud from coming into the house, and provide a nice aesthetic on the outside. However, there’s only so much these little mats can handle. Instead of letting your doormats fill up with dirt and mud, inevitably creating more mess inside and more work for you, vacuum or hose them off with a powerful stream to keep them looking new and inviting for your guests. Arguably one of the most under-cleaned parts of a home, it’s imperative to give some love and attention to your windows. Wait until an overcast day to see what you’re working with, as direct sunshine can lead to streaks while cleaning. Equipped with glass cleaner and a microfiber cloth, get to work making them squeaky clean. Don’t forget your blinds! Run a duster over those, too! We put our kitchen sinks through the wringer. From raw meat to dirty dishes, the kitchen sink sees it all. Make sure to give your sink a little love and scrub it down with soap and a sponge. Using a disinfectant is a plus. Can’t get rid of that unwanted smell in your garbage disposal? Throw a few lemon rinds down there following cold water to rid the stink. Microwaves are easy to ignore since the inside is rarely shown — only opened on the rare occasion to heat something up or make delicious popcorn. However, its insides get dirty too and it’s key to keep it nice and clean. With a moist cloth, run over the insides and take the removable tray to the sink for a good washing. Kudos to you for using reusable shopping bags, the environment thanks you for cutting down on wasteful and harmful plastics. However, it’s easy to forget that your reusable bags are made of fabric which requires regular washings to remove any lingering food bacteria and germs. Make sure to pay attention to your dryer settings depending on the fabric though! The countertops in your kitchen see a lot of action throughout the day and it’s easy to forget that they need cleaning, too! If your counters are made of granite, dig out the granite polish to restore their natural shine and beauty. But for daily wipe downs of germs and mess, use wipes with a mild formula. As we enter the warmer months, the real estate market is picking up! With the help of The Degnan Group, we’ll find you and your family the perfect home to create long-lasting memories that will stand the test of time. Contact us today at (419) 345-7808 to get started.